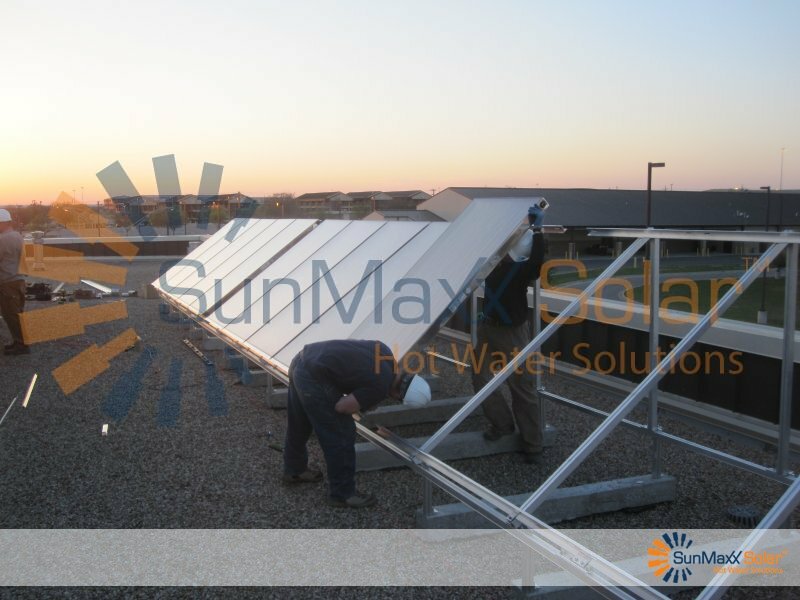 In the Summer of 2011, SunMaxx Solar in conjunction with Johnson Controls and Intelligent Green Solutions (IGS) completed the installation of a Solar Thermal System at Fort Hood, one of the world’s largest Military bases located in Killeen, Texas. 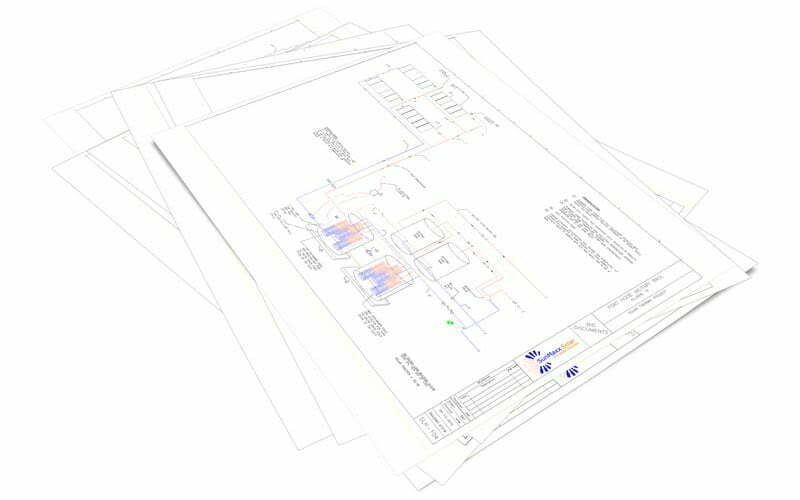 A total of 93 TitanPowerPlus SU2 series flat plate collectors were installed across five buildings, in addition to solar pumping stations and storage tanks. 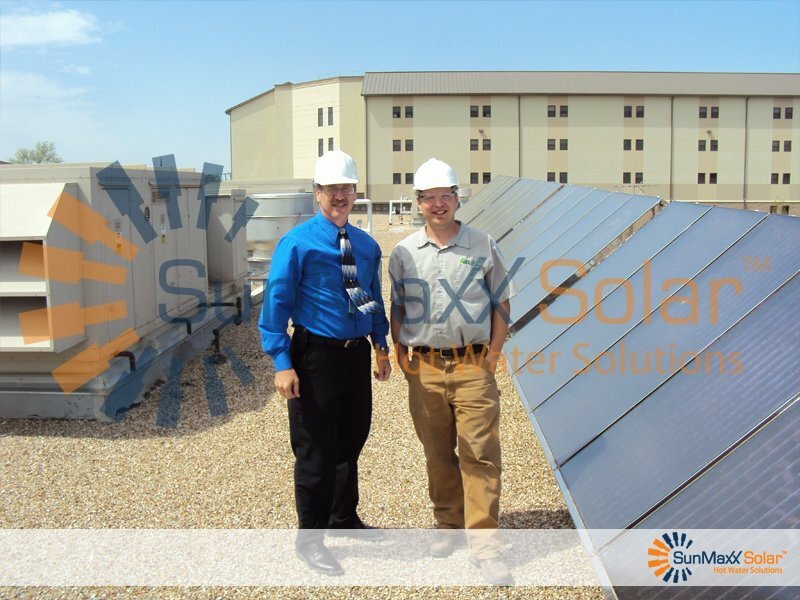 Each building was also outfitted with a custom ballasted drain‐back mounting system designed specifically for the US Military. 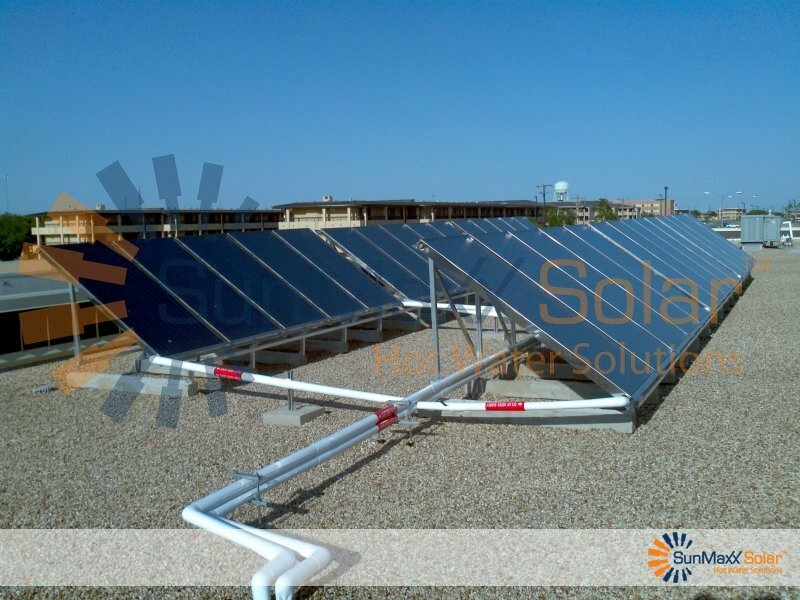 This solar thermal system was installed for a domestic hot water heating system, which will pre‐heat water for five of Fort Hood’s dining facilities as well as a large pool collector installation. These buildings, in total, spanned over 94,000 square feet of Fort Hood’s campus. The system was completely installed and commissioned during the Summer of 2011. The cost of the project totaled ~$450,000. The solar system was created to offset natural gas consumption with clean, renewable solar energy. The system will effectively function as a pre-heater, with the existing fossil fuel heaters meeting any load not served by solar energy. The amount of potential energy savings was approx. 50% of their loads. 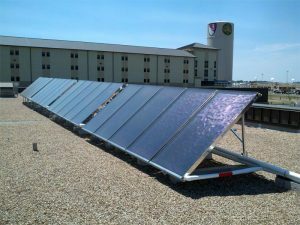 The installation, which was a custom design outfitted specifically for the military, was part of an energy conservation program to help reduce Fort Hood’s carbon footprint. 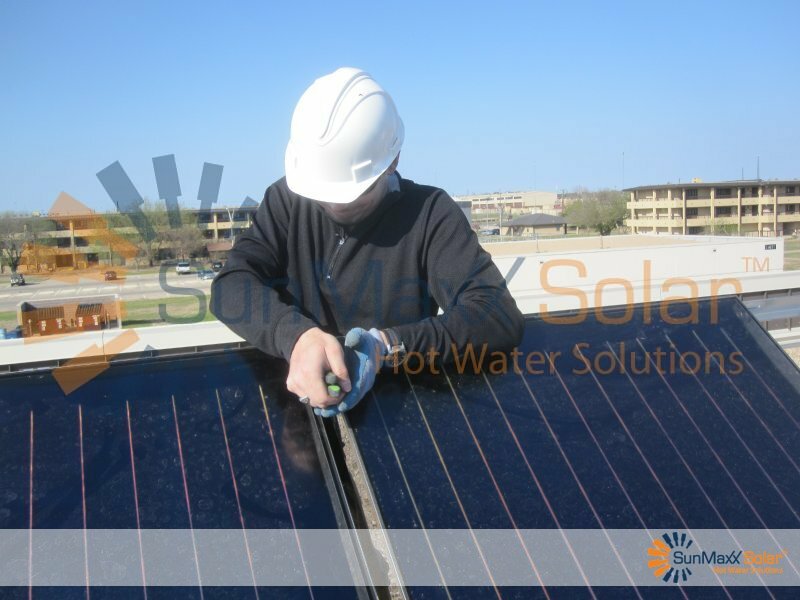 This was also a pilot study to see the effectiveness of using solar thermal on the base, which covers a total of 340 square miles in central Texas. Summary of Fractional Energy Savings for each building is below. 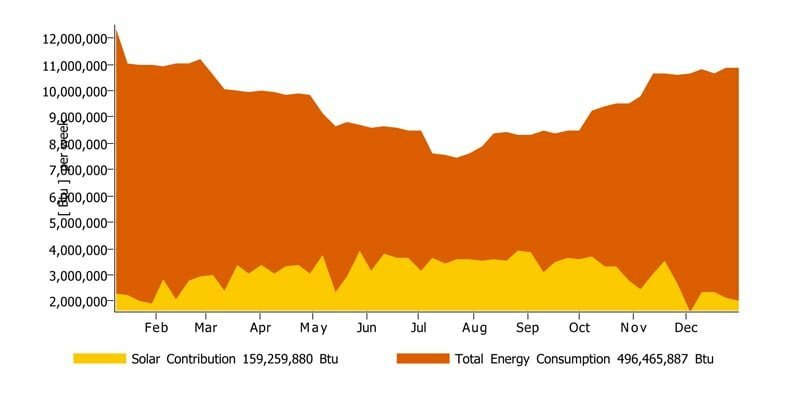 This figure shows the percentage of energy that can be saved using a solar thermal system as opposed to a conventional heating system.